Poole Farm Certified Location opened in August 2011. 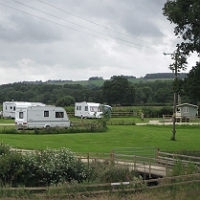 It is an adult only (16+) touring site for Caravan Club members only and is open all year. Dogs are welcome if kept on a lead at all times. 5 hardstanding pitches, each with their own 16 amp electric hook up and drinking water. WC & Shower, Recycling facilities, Tourist Information, Chemical Disposal Point, Grey Water Disposal Point. Wi Fi is included at no extra cost.